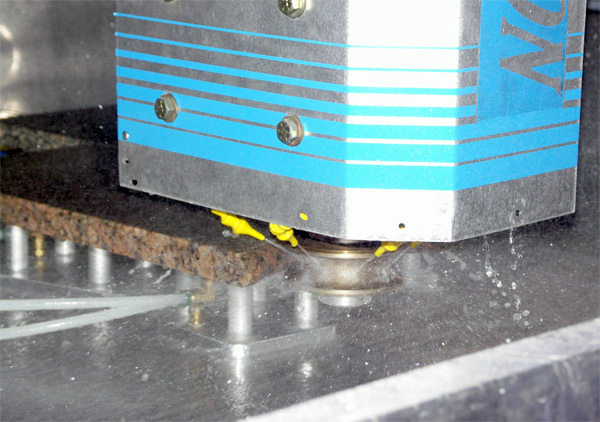 CNC Granite Router, Stone machining center for Granite, Marble and other stone materials. 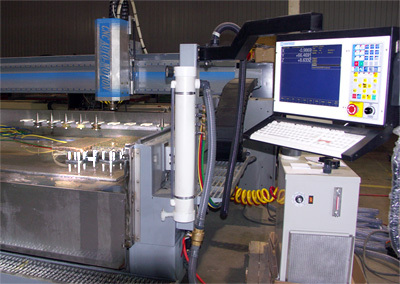 CNC sculpting machine. 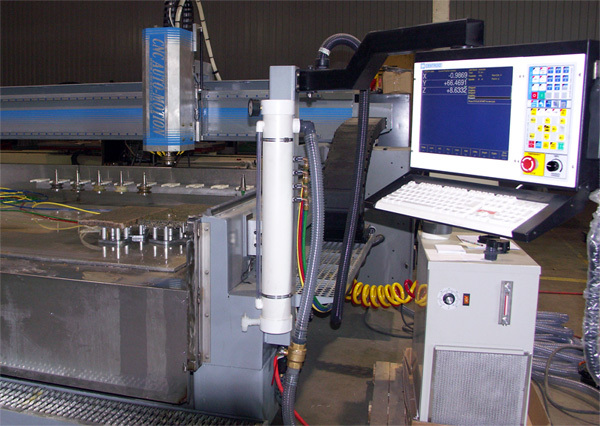 This large format CNC gantry machine has been specially designed for cutting Granite and other stone materials and is controlled by a CENTROID M-400 CNC control. CNC Auto-motion makes use of the CENTROID Axis slaving feature by driving both sides of the gantry for ultra precise positioning along with speed and power. An 8 position rack mounted tool changer is employed for automatic tool changes. CENTROID's easy CNC programming allows the designers to create detailed decorative designs and other architectural details for counter tops for kitchen and bathrooms, bars, signs, tiles, monuments & memorials, and many other custom applications. The ultra smooth CENTROID CNC control produces excellent surface finishes. Special profile cutters follow the programmed path. 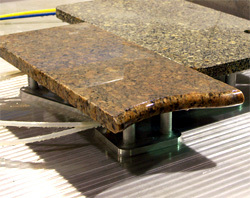 The Granite is held in place by a vacuum system. 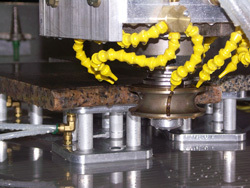 Automatic tool changes allow complete machining of piece in one setup and program reducing operator involvement. Shapes or profiles for the Granite can be drawn in any drawing program such as Corel draw, AutoCad and many others. The CENTROID will convert the DXF file to G-code automatically, you just have to answer a few questions. click here for more CAD to CNC info. 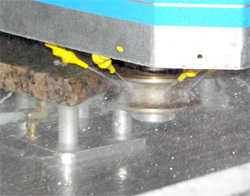 The cutter is continuously sprayed with coolant while cutting. Multiple profile passes are automatic. The Z axis on this machine has 14" of travel which makes the machine flexible allowing you to machine a wide variety of shapes and sizes and makes setup easier. Precision ballscrews are used throughout along with linear rail for the highest accuracy with the most rigidity which provides smooth cutting action. 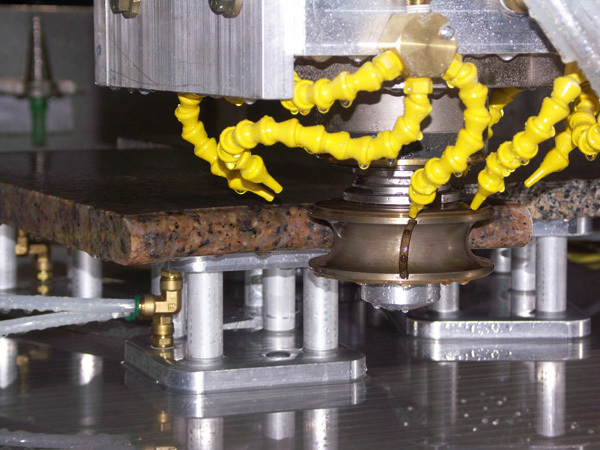 Special liquid cooled spindles are used which are rated for this harsh environment.